So how much of Avengers: Endgame do you want to see before going in, eh? With only weeks to go before experiencing the whole thing in full, it may be a good idea to avoid clips, interviews with Chris Evans, etc. and go in knowing as little as possible. Or if you're in need of having one lingering question answered really early, you can check out this new clip. 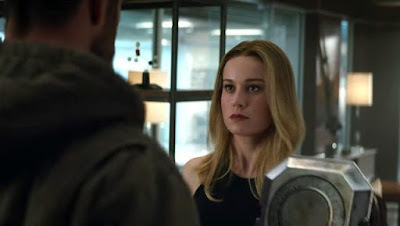 This scene is one most people have probably already seen, as it connects directly with Captain Marvel and lets us know where the heck she's been all of these years. Hey ya'll, she's been busy on the other side of the galaxy, right? It's also the first time we get to see Brie Larson interacting with much of the Avengers cast, and remember, she shot Endgame before she filmed Captain Marvel so she had to figure out the character without much of a guide to doing so. Avengers: Endgame opens April 26th.